This hearty, clean tasting bowl o’goodness is modelled on the sort of food that they feed to sumo wrestlers in Japan – but don’t be put off from trying it for fear of putting on weight. When it comes to food, sumo wrestlers go for quality and quantity – piling on the pounds with vast amounts of really good, healthy food. 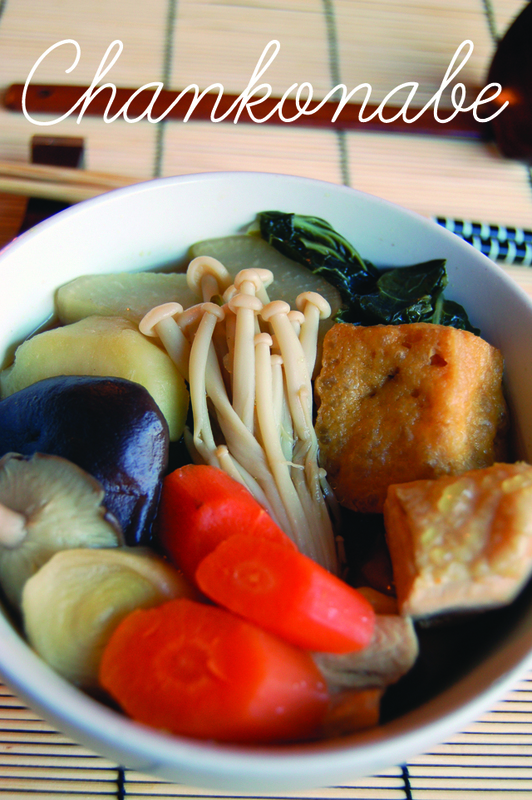 Chankonabe is a kind of nabemono, or one pot dish, where all of the diners help themselves from a central, simmering stew. Not only does the tabletop stove the stew sits upon keep the diners warm in winter, but by sharing, friendships and familial ties are strengthened. Because sumos live together in groups in so-called stables, there is an obvious advantage to sharing meals – and although the origins of the word ‘chanko’ are unclear, many think the word comes from ‘chan’, for father and ‘ko’, for child, indicating the strong ties between a stablemaster and his trainees. The chanko-ban, or chanko cook (that’s you, if you’re following my recipe!) is usually a junior sumo wrestler. There are no rules about what goes in chankonabe – the contents are dictated by the seasons, what’s in the kitchen, and personal taste. But generally, chicken is favoured, and beef and fish could be considered bad luck, as both represent a sumo in defeat (on all fours, or completely legless!). Is it really chankonabe if it’s not served to or by a sumo? Well, maybe not – but eat it with a warrior spirit! This recipe will serve six adults, so it’s great for an informal dinner with friends. 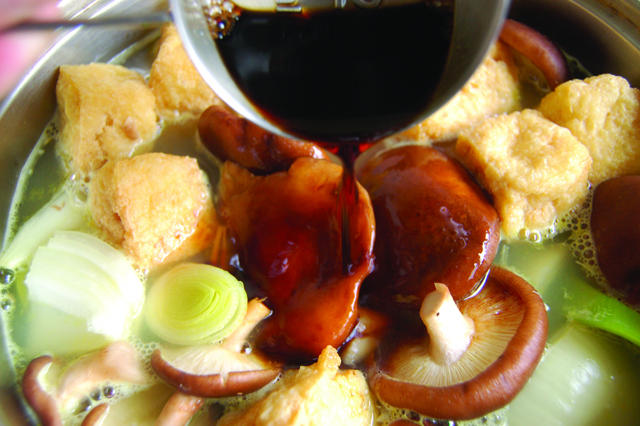 If using fried tofu, place in a colander and blanch with boiling water to remove excess oil. When cutting the vegetables, try to cut them diagonally to make them look nicer. Slice the radish, potato and carrot, parboil (submerge into boiling water for around five minutes), then drain and keep to one side. Slice the pak choi into chunks. Wash the leeks and slice white parts only. Cut the chicken into 2-inch chunks, keeping the skin on. 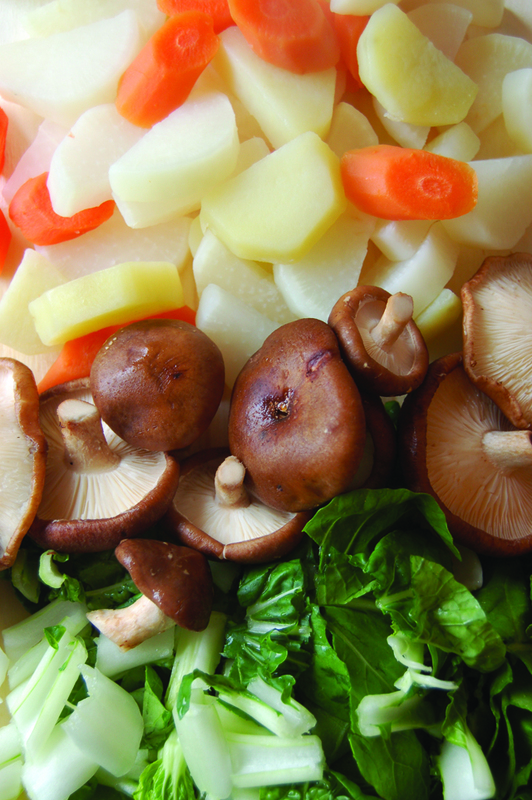 Prepare the shiitake mushrooms by wiping them with a damp cloth and trimming down the stalks. The enoki mushrooms should be trimmed and separated into smaller bundles. 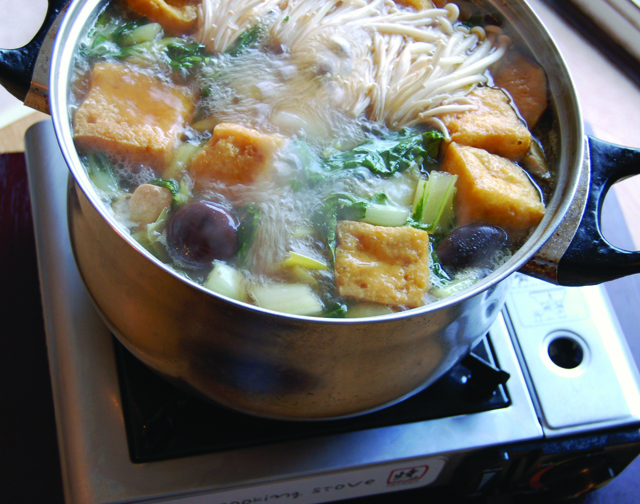 Add the chicken stock, chicken, onions, shiitake mushrooms, leek and tofu to a large pan, and bring to the boil. Add your soy sauce and simmer for 15 minutes, or until all the ingredients are cooked. Keep skimming off any scum that might form. Add the potato, radish, carrot and pak choi and simmer for five more minutes. Add the mirin and shimeji mushrooms, then simmer for a few more minutes and season to taste with salt. Serve in a pot simmering on a tabletop stove, or alternatively, dish into bowls. Seconds are compulsory! 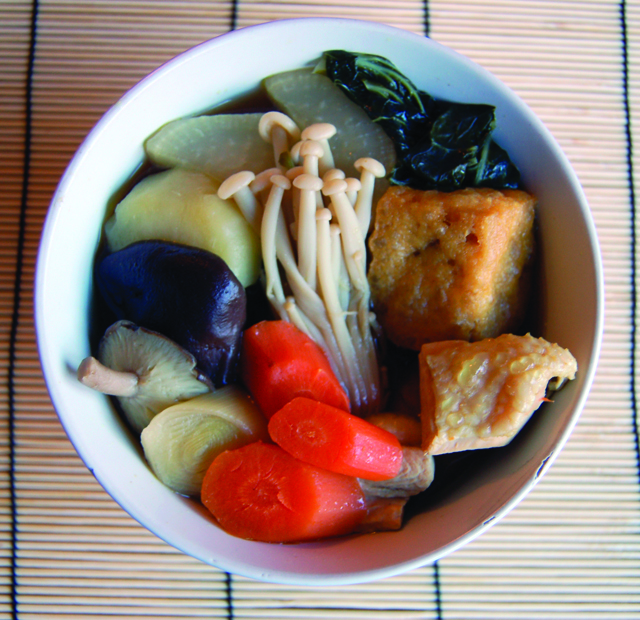 Once you have had your fill of the chankonabe, remove any remaining ingredients, then add the udon noodles to the soup, simmer for around five minutes, and serve with the broth. I have a portable, tabletop stove that I like to use for this, but you can serve yourselves from the pot at the table without having heat under it, as it stays warm for a while due to the sheer volume of food inside! It may seem like a simple dish, but somehow, the finished product is so much greater than the sum of its parts. I made this for my cousin and mum back in 2009, and they still talk about it… Maybe it’s time to make it again!